Aug. 31, 2018 — With a daughter and six nieces, Rick Stuck ’82 thought some family member would surely follow his footsteps and attend Grinnell College. But up to this year, Stuck, a member of the Alumni Council, had gone 0-for-6 in his recruiting efforts. That’s why he was overjoyed when his youngest niece, Annie Estes ’22, decided to attend Grinnell. That elation compelled him to fly from Wyoming and back in 24 hours so he could witness the start of his niece’s Grinnell experience at Wednesday’s Medallion Ceremony. Alumni Council member Rick Stuck ’82 and his niece Annie Estes ’22. Estes was one of about 470 first-year students who received medallions at Herrick Chapel Wednesday, the day before fall classes began. The ceremony concluded New Student Orientation and connected the College’s past to the future. The Medallion Ceremony pays tribute to an important event in the College’s history. On June 10, 1846, James J. Hill of the Iowa Band laid a silver dollar on the table at a meeting of the Iowa College Association, declaring it to be the seed of an endowment to support outstanding students and faculty. New students are annually given a silver medallion to commemorate Hill’s gift and signify a responsibility to help sustain the College in the future. The class of 2022 hails from 45 states, Washington D.C., and 20 countries. 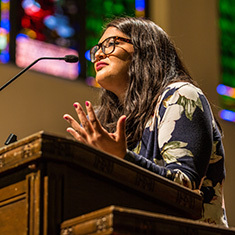 In her speech before the medallions were handed out, Alumni Council member Graciela Guzmán ’11 related her own experience 11 years earlier as a new student from Los Angeles. 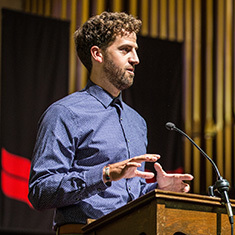 Will Schwaller ’09 wrapped up the ceremony by sharing advice that he wished he could have told himself as a first-year student, such as taking classes out of your comfort zone and making friends with classmates that are outside of your usual circle. “You don’t have to stick to your path, and you’ll likely be better off for having strayed because you will have a broader range of insight and knowledge that you will take with you wherever you go,” he said. Grinnell College expects to enroll 470 members of the Class of 2022. Official enrollment data will not be available until late September, following the college’s official census date. The students of the class of 2022 were active members of their high schools and communities. Here is a snapshot of what they participated in before enrolling at Grinnell College.